Be aware that not everyone in the world is like you and not every product is designed for you. 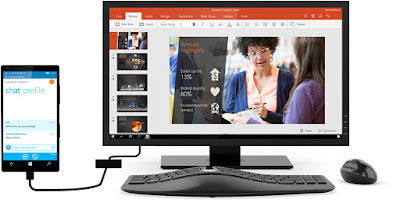 Continuum for phones is almost certainly one such product. It's only available on expensive, "high-end" devices. It requires a special dock. It doesn't work with all apps. "If I go anywhere where I might need to work on something where a large screen is beneficial or required I'd have my laptop with me anyway." Even if you could use it with, say a monitor/TV in a hotel room, that you'd need to take a dock, keyboard, mouse and related cables with you, it would be easier to just take a laptop. Because of these arguments, the concept is often dismissed as interesting but not really relevant by people who talk about such things. People who are often developers or members of the tech press who focus on [Windows] phones and devices. Here's the thing, though: what if it isn't intended for them as an audience? As a feature, the functionality necessary for this is probably baked deep into the core of Windows 10. Work on Windows 10 probably started about 18 months to 2 years ago. Around that timeframe (I know it was a long time ago but trust me, I remember), there was much discussion and speculation that the opportunity for Windows Phone lay in "emerging markets" and with the so-called "next billion". These people would be owning a smartphone as their first phone and probably their first computing device. Do You See Where We Are? We have people considering their first computing device. These people have no historic commitment to an existing ecosystem and will be more willing to decide among all providers/options. Even if they only do buy a phone they will probably be aware that there are some computing functions that are easier and preferable to do on a larger screen. Microsoft is offering a unique differentiator that appeals to and brings extra value to a new market in ways that the competition doesn't. But It's so Expensive. How Could This Be for Emerging Markets? I suspect it's expensive because it's new. As we've seen time and time again, technological solutions get cheaper over time. Expect this in a wider range of, cheaper, phones in the not too distant future. The need for a special dock will also likely go in the future too. But Everything Is in the Cloud and Computers Are Constantly Getting Cheaper? Yes. But a slightly higher priced phone may still be cheaper than a separate PC/laptop. It should not even be necessary to buy a separate monitor as a TV could be used so then the only extra expense is a keyboard and mouse and they can be obtained very cheaply. Even when "everything" is in the cloud there are still benefits to having some types of content stored locally. Especially if you're in a part of the world where connectivity isn't as cheap, reliable or available. As more services are delivered to the web first, being able to use any service/site on a large monitor may be preferable. Especially if there isn't a dedicated app--yet. If That's the Case, Why Try and Sell the Feature With High-End Devices in Mature Markets? If the high-end devices are currently required due to the early stages of the technology involved, then that's the only market available. These are also the devices that developers use. If the hope is that when cheaper devices come to these new markets they will have this functionality it will be important that apps have been built to work with it. Due to the lead times of app development and update that may mean starting to build and update such apps now. If this is the plan, Microsoft needs developers to get into the habit of considering large screen display for their mobile apps now. While the story about using devices in hotel rooms may not be a great one it might be enough to get the ball rolling. Plus, if developers are having to design their UI to work on both small and large screens it might help them think about everything in between too. Well, there's another possible benefit to all this too. Windows app developers have traditionally been much more focused on phones rather than desktops and tablets. Perhaps, now, if they have to consider a desktop-style interface layout for their phone/mobile-based apps, the lack of extra effort that's also needed to also get the app working and available on desktop will encourage them to make it available there. I know Windows on phones has suffered from an "app gap" but it's even worse on the desktop. Creating more apps that work on both desktop and mobile can only be a good thing for the platform, consumers and ultimately developers. Well, that's what I think. Does this seem reasonable? Or do you have other ideas?